The Space-Based Infrared System (SBIRS) is a consolidated system intended to meet the United States' infrared space surveillance needs through the first two to three decades of the 21st century. The SBIRS program is designed to provide key capabilities in the areas of missile warning, missile defense and battlespace characterization. 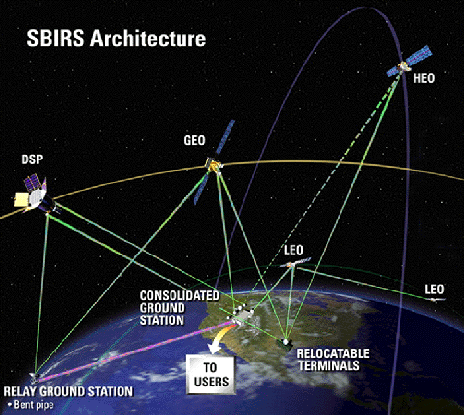 SBIRS is an integrated "system of systems" that will include satellites in geosynchronous orbit (GEO), sensors hosted on satellites in highly elliptical orbit (HEO), and ground-based data processing and control. A complement of satellites in low earth orbit was planned as part of the program (SBIRS Low), but this has been moved into the STSS program. SBIRS ground software integrates infrared sensor programs of the U.S. Air Force (USAF) with new IR sensors. SBIRS continues to struggle with cost overruns, with Nunn-McCurdy breaches occurring in 2001 and 2005. By September 2007, the expected project cost had increased to $10.4 billion. The original contract consisted of 2 HEO satellite sensors and 2-3 GEO sensors (and satellites) with an option to buy a total of 5 GEOs. In December 2005, following the third SBIRS Nunn-McCurdy violation, the government decided to compete GEO 4 and 5, with an option to buy the GEO 3 contingent based on the performance of the first two. Additionally, the government started a potential SBIRS High replacement program, writing out proposals in June 2006. On June 2, 2009 Lockheed Martin announced it had been awarded a contract for the third HEO payload and the third GEO satellite, and for associated ground equipment modifications. On July 10, 2009, Lockheed Martin was awarded $262.5 million as down payment by the USAF towards the purchase of a fourth satellite. The first GEO satellite of the SBIRS program, GEO-1, was successfully launched from Cape Canaveral on an Atlas V rocket on May 7, 2011. In summary, as of March 2013, a total of 7 satellites carrying SBIRS or STSS payloads have been launched: GEO-1 (USA-230, 2011), GEO-2 (USA-241, 2013), HEO-1 (USA-184, 2006), HEO-2 (USA-200, 2008), STSS-ATRR (USA-205, 2009), STSS Demo 1 (USA-208, 2009) and STSS Demo 2 (USA-209, 2009). The ground segment of SBIRS consists primarily of the Mission Control Station (MCS) at Buckley AFB, Aurora, Colorado, and the Mission Control Station Backup (MCSB) at Schriever AFB, Colorado Springs, Colorado. In addition, Joint Tactical Ground Stations (JTAGS) provide deployable downlinks for SBIRS data. ↑ "INTELLIGENCE AUTHORIZATION ACT FOR FISCAL YEAR 2000: Space-Based Infrared System-High (House Report 106-130)". U.S. Government Printing Office. 7 May 1999. http://www.gpo.gov/fdsys/pkg/CRPT-106hrpt130/html/CRPT-106hrpt130-pt1.htm. ↑ "Space Based Infrared System High Program and its Alternative (GAO-07-1088R)". Government Accountability Office. 12 September 2007. http://www.gao.gov/htext/d071088r.html. ↑ "U.S. Air Force Awards Lockheed Martin $1.5-Billion Contract For SBIRS Follow-On Spacecraft". LM. June 2, 2009. http://www.lockheedmartin.com/news/press_releases/2009/0602ss-sbirs.html. ↑ Vorman, Julie (July 10, 2009). "Lockheed gets $262.5 million U.S. satellite down payment". Reuters. http://www.reuters.com/article/rbssIndustryMaterialsUtilitiesNews/idUSN1026553020090710. ↑ "Rocket blasts off with missile-warning satellite". Reuters. 7 May 2011. http://www.reuters.com/article/2011/05/07/us-usa-military-satellite-idUSTRE7462AW20110507. ↑ "U.S. Air Force Awards Lockheed Martin $1.5-Billion Contract For SBIRS Follow-On Spacecraft". http://www.lockheedmartin.com/news/press_releases/2009/0602ss-sbirs.html. ↑ "Molczan in Satobs message 30 September 2005". http://www.satobs.org/seesat/Sep-2005/0336.html. ↑ "Molczan in Satobs message 24 February 2008". http://www.satobs.org/seesat/Feb-2008/0515.html. ↑ Capaccio, Tony, "Delivery Delayed For Lockheed Martin's Early Warning Satellite", Bloomberg.com, Sep 30, 2009.